We have a new deck. The wood is p.t. and is double kiln dried. We like the reviews associated with your stain. We were hoping for a light grey color but you don't seem to have one. Any solutions for us here in Forest City, N.C.. Lastly, given our wood is double kiln dried, how long should we wait to begin the total procedure. The Defy Extreme comes in a Driftwood Gray. Wait a couple of months and use the Defy Wood Cleaner and the Defy Wood Brightener for the prep. Two questions: 1) I used DEFY Extreme Semi-transparent (light walnut) on our deck 3 years ago. Now it's time to re-stain. How much of the old DEFY stain needs to be removed before I apply the stain? Can there be some left, or does it all need to be power-washed off down the the bare cedar? 2) Last time I bought the stain, I found a local retailer (paint store) and bought it there. Can I only buy your stain via this website now? Thanks! 1. Some can be left. 2. We are an online dealer only for Defy. My 14x16 pressure treated deck has been sanded down to bare wood. Boards are in good condition. Can you please advise what stain should be used, oil or water based. Also, I do not want to use a wet on wet product. I live in Ontario, Canada and my deck faces north. If I need 2 gallons how much would the total cost be including shipping?? Hello, Defy is a wet on wet application and only comes in water-based. In addition, you will need to remove all of the stain from the floor prior to using the Defy. You still have some old stain in spots around the edges, etc. For shipping charges, please add to cart and enter your shipping info to see the total cost. Do you have any distributors that carry your product or is direct shipping your only method? I was wondering if any national chains carried your product? Defy is not carried at Nation chains. We are an online dealer that ships directly to your home. Can you ship the Defy Extreme Semi-Transparent to Canada? The deck had never been cleaned as was covered with lichen and dirt. I power washed it 3 weeks ago and it looks great. The deck has no rails and gets a lot of shade. I plan to use Defy Extreme. Should I prep using the cleaner and brightener? How much wood cleaner do I need for a 1000 sq. ft deck? 2 of the 2.25# containers. I have a redwood deck about 1000 sq. Feet. It’s 4 years old and in need of a restrain. 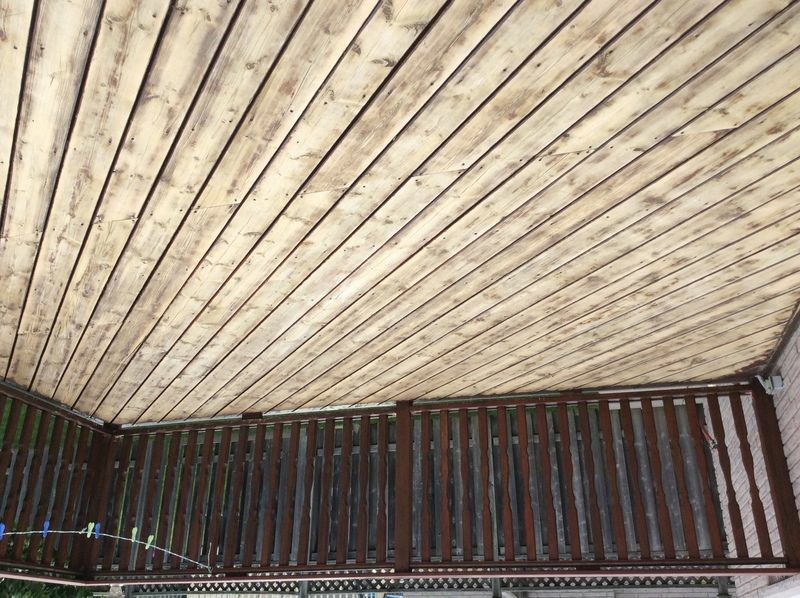 When the contractor built the deck he only stained the top. Needless to say, there is warping and peeling. I plan to rent a large sander and sand the whole deck. Is there any advice you can offer so I can get a nice looking deck? I live in Flagstaff Az. at an elevation of 7250 feet. It is normal to only stain the top exposed wood. When sanding, do ot use a grit finer than 80. After the sanding do a light cleaning with the Defy Wood Cleaner to help open the grain for the stain. Hi, shipping depends on where you live? Could be 2-4 business days on average. My deck is 6 years old. It has never been stained but I have put Thompson’s water seal on it a couple of times in the past. The last time that I sealed it was about 3 years ago and it appears to have all worn off. Is there anything else that I would need to do other than cleaning it good before applying the wood stain? Also, is there any need to put a sealer on it after applying your stain or does your product stain and seal? Prep with the Defy Wood Cleaner and then the Defy Wood Brightener. You cannot nor is there a need to apply a sealer on top of the stain. Hello, We ship directly from our site to your home. any dealers near antioch, ca zip 94505? We ship directly from our site to your home. Are there any dealers in northern CO, would like to ask some questions and maybe see if they have some references of people who use the product in this area. We are an online dealer for Defy. We personally do not have a dealer there. We ship to Canada. No dealers there. Where can I buy Defy Extreme stain in Minnesota? Use the Defy Extreme Stain. The Marine is more for docks. No dealers in Canada but we do ship there. Closest dealer to 60453 please. Hello, we ship online to your area.